The cable Coil Master is for the assembly of your reconstructable atomisers and drippers. The Coil Master Twist Wire ameliorates the vape from your coils. The two twisted tresses produces openings which the captures the liquid and increases the production of the vape and renders good flavours. The Coil Master Twist Wire cable is conditionned in a 4.50m reel in plastic. 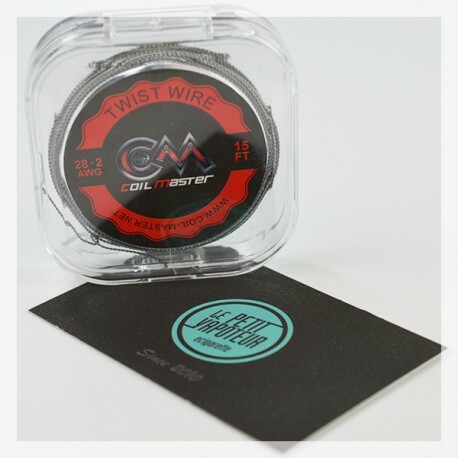 The Coil Master Twist Wire ameliorates the capacity of vape from your coils. With the two cable tresses, the Twist Wire produces a multitude of ruggedness which forms the droplets of liquid and ameliorates the humidification of the coil, the production of the vape renders good flavours. "Ouais. Il y a mieux. Je m'en sers pas trop. On peut pas faire de subhom avec." "idéal pour faire s'est résistances soit même"
"Bon fil. Moins bonne qualité que ceux de UD." "Un peu déçu par rapport aux échos que j'avais eu sur ce produit, se tord un peu trop facilement"
"fait bien son taf ."